In July 2012, a team of 4 people, consisting of myself, two MA students doing Japan-related studies at UEA and SOAS and a researcher currently doing an internship at the Sainsbury Institute, visited Japan for two weeks. I am currently an Academic Associate of the Sainsbury Institute, having been a Fellow, and I also lecture in the School of World Art Studies and Museology at UEA. Funded by a grant from the Daiwa Anglo-Japanese Foundation, the study trip was part of an ongoing collaboration between the Centre for Archaeology and Heritage at the Sainsbury Institute and various project partners in Japan. This collaboration was established in response to the crisis faced by archaeologists and heritage specialists in northeastern Japan since the March 2011 earthquake and tsunami. The trip’s purpose was to meet Japanese professionals and students who are involved in conserving and restoring heritage assets affected by the earthquake and tsunami, and at the same time to explore ideas about the future management of heritage sites in northeastern Japan. Our visit was facilitated by two project partner institutions: the Tohoku University in Sendai, represented by Professor Fukasawa Yuriko; and the Nara National Research Institute for Cultural Properties, represented by Professor Matsui Akira. Meetings took place in Sendai as well as in the Tohoku coastal area which was severely hit by the tsunami, including Rikuzentakata and Ofunato in Iwate Prefecture, and Matsushima, Ishinomaki and Onagawacho in Miyagi Prefecture. We also met colleagues at various institutions involved in the rescue of damaged cultural property, such as Tokyo National Museum and the National Museum of Nature and Science in Tokyo. Our visit to the Tohoku coastal area was extremely informative and in some ways edifying, though it was unforgettably moving. We had all seen video footage of the tsunami’s devastating rampage and more than a year had passed since March 2011, but being there, where so many human lives and buildings had been washed away, gave us strong mixed feelings. 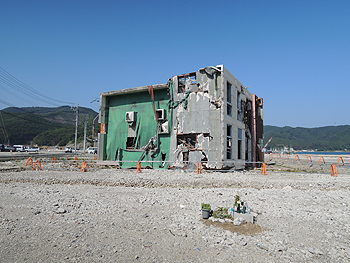 The centres of Rikuzentakata and Onagawacho were vacant as a result of the clearance of most of the debris. 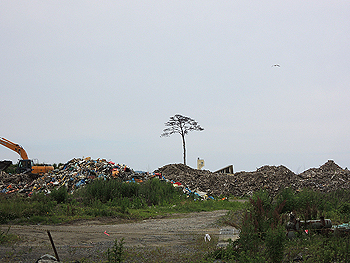 In Ishinomaki we saw a similar scene, except that several huge factories, presumably constructed after the disaster, were in full operation producing materials urgently needed for redevelopment. Massive piles of timber and long rows of containers suggested that the town was being reconstructed at a tremendous pace. 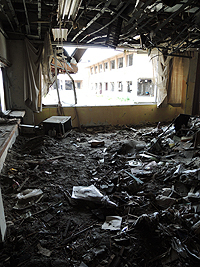 It was an eerie scene, even if we could feel that something new – probably hope – was emerging in the devastated area. In this context the views we heard about the restoration of damaged cultural heritage really made sense, for we could understand them empathetically. We learned that local culture is on the rise again, with the help and involvement of many people, and that restoration of cultural heritage is playing a major part in that revival. Yet our own position felt ambivalent. In the local context we were definitely outsiders. Perhaps people mistook us for tourists, looking at the destruction out of pure curiosity. Sometimes our consciences loomed large and we had to ask ourselves: is it really right to be here as observers, taking pictures of damaged buildings, when local people are labouring to restore their lives and communities? This is a complicated issue, and we were not able to reach a clear answer to our own question. Quite understandably some of us stopped taking pictures; however legitimate it is to collect information and data for research purposes, this must be done ethically and with due consideration for the feelings of the very people about whom we research. I, on the contrary, was compelled to continue photographing the devastated towns. I am still not sure if it was the right thing to do, but I just wanted to grasp exactly what had happened there in March 2011 and how the whole landscape of the area had been changed. I wanted to make sense of that landscape, for myself and for the local people. Among the four of us on this study trip views differed, but we all agreed on one thing. It was absolutely right that we went. By being there we could profoundly comprehend how cultural heritage had been affected and damaged by the disaster, and we could also see how it was being restored by the hands of so many people, both within the local area and beyond it. All in all it was an incredibly worthwhile visit.